I need clients to fill in emails correctly with the @ symbol and a dot extension. Same with URLs... they need to be in the correct format. www.sitename.extension. Is that possible with Jot Form? 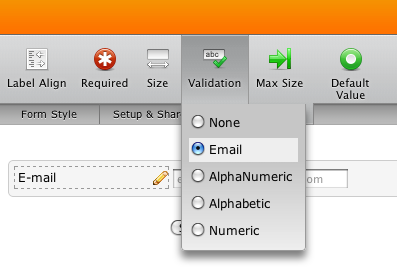 To add email validation for a question, select it and then choose "Email" on the "Validation" button on the toolbar. It is not possible to do the same for a URL.